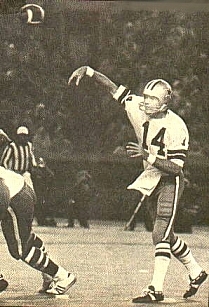 Leading the Cowboys offense in 1971. 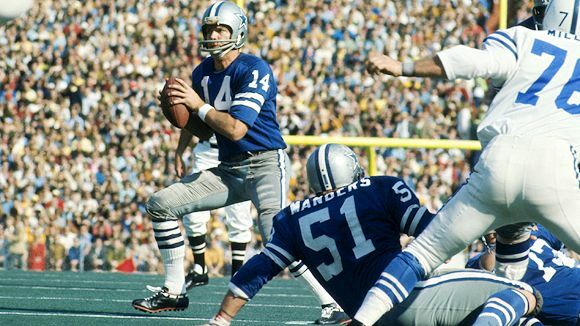 Also pictured is center Dave Manders (#51). 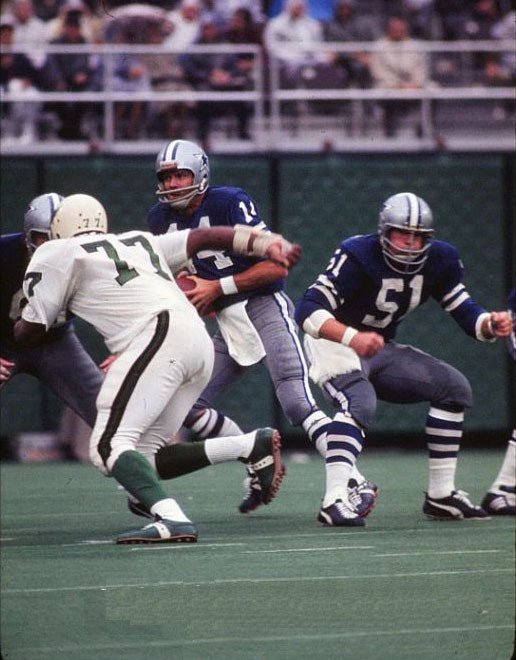 The Eagles Ernie Calloway (#77) applies the rush. 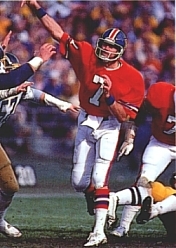 At thee age of 34 he was traded to the Denver Broncos in 1977 where he not only became the starter, but led the Broncos to their first ever Super Bowl appearance. 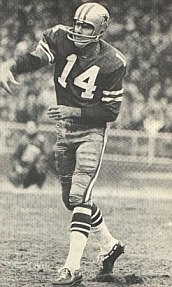 He was selected Comeback Player of the Year as he led Denver to a 12-2 record. 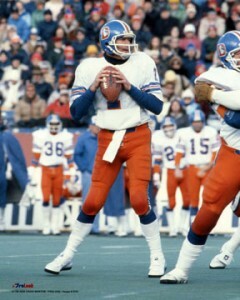 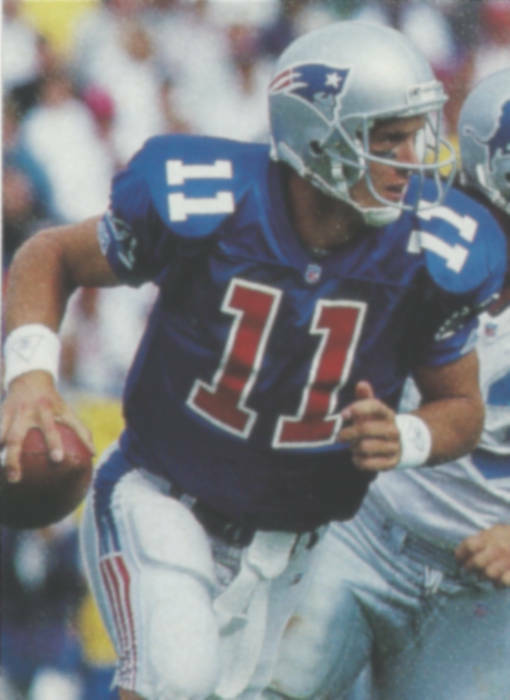 He remained a Bronco until he retired in 1982 as the top passer in franchise history. 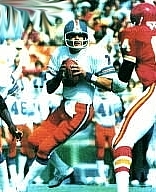 Today he still ranks third on the Denver All Time passing Yards (11,895) and Touchdowns (74) List. 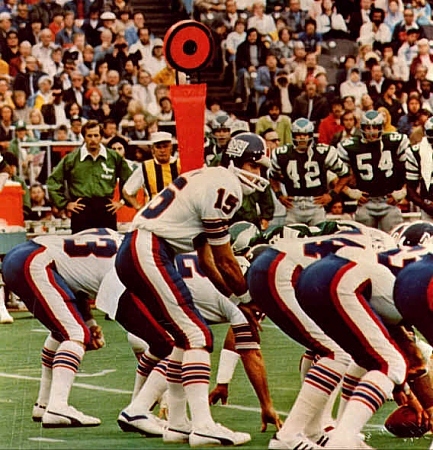 The offensive line of the Denver Broncos sets up protection in 1977. 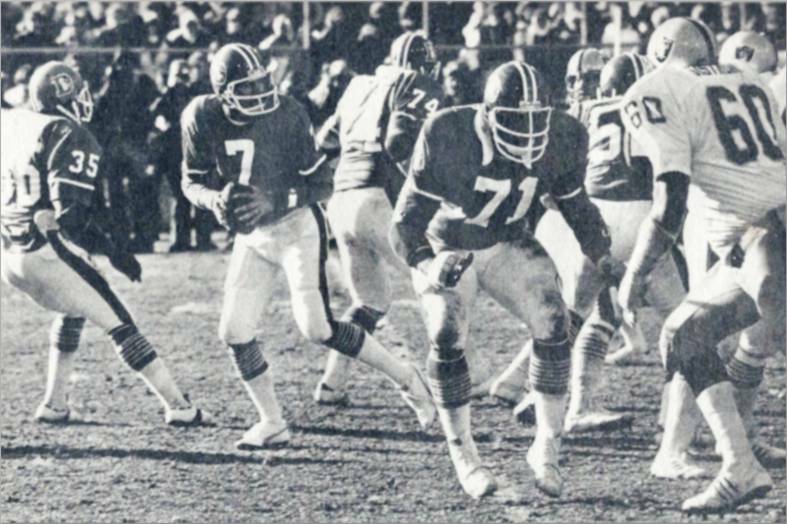 Broncos pictured are #7 - Craig Morton, #35 - Lonnie Perrin, #74 - Andy Mauer and #71 - Claude Minor. 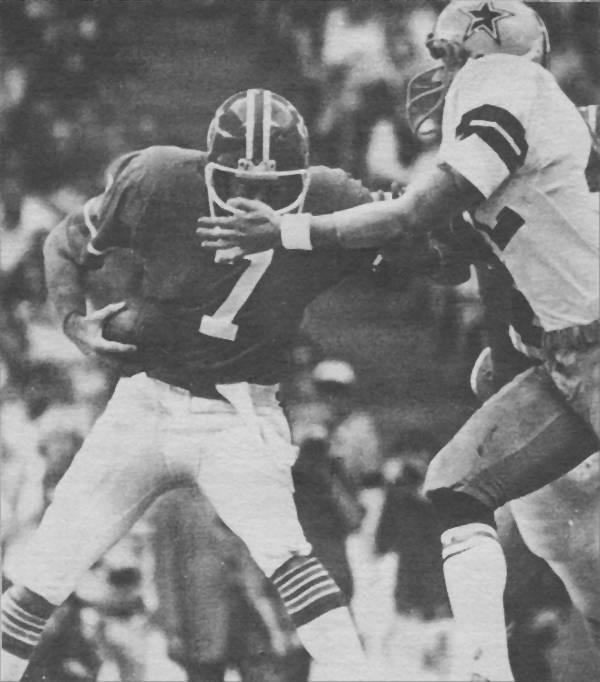 The Raider rushing is #60 - Otis Sistrunk. 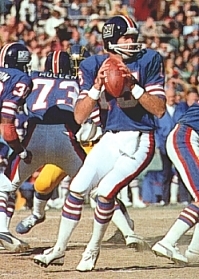 Chosen as the Comeback Player of the Year, 1977 was his best season in years. 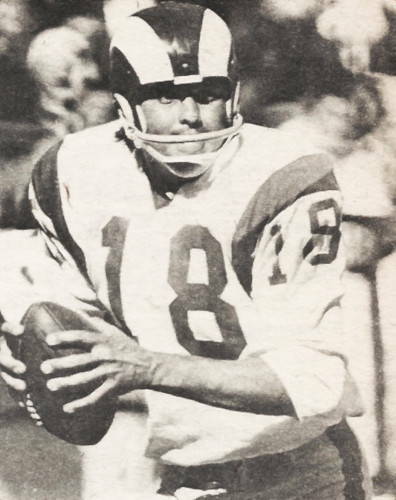 Passing for 1929 yards and 14 touchdowns he guided Denver to 12 victories, and AFC Championship and the franchises first ever Super Bowl contest. 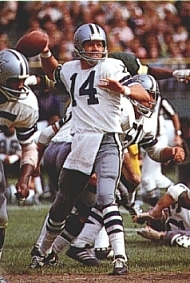 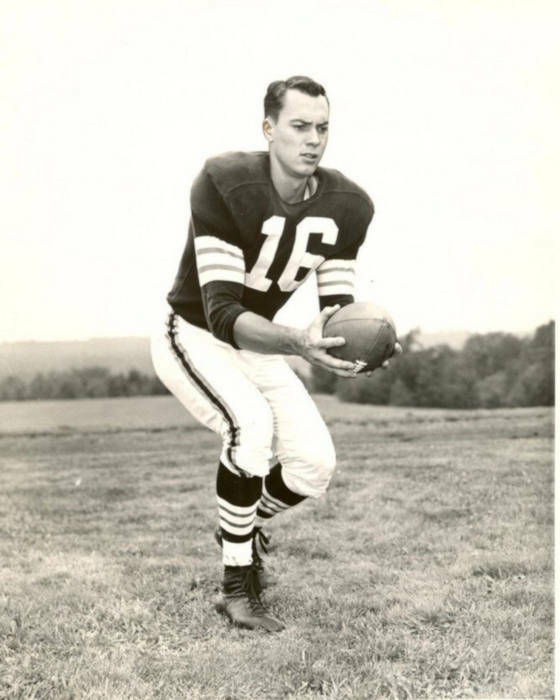 The Cowboys 1st round draft pick in 1965 he had enjoyed an enormous career at the University of California-Berkley. 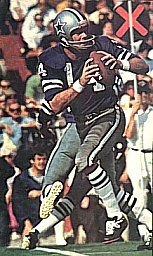 He played 10 seasons with the Cowboys leading Dallas to their first Super Bowl appearance against the Baltimore Colts in 1971. 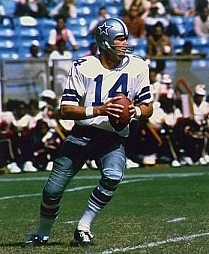 He is ranks #6 on the Cowboys franchise All-Time Career Pass Completions (685) and Yards (10,279) as well as #7 in All-Time Career Touchdown Passes (80).